A chilling side to Yudhishthira's personality came to the fore as the Kurukshetra war was dying down. 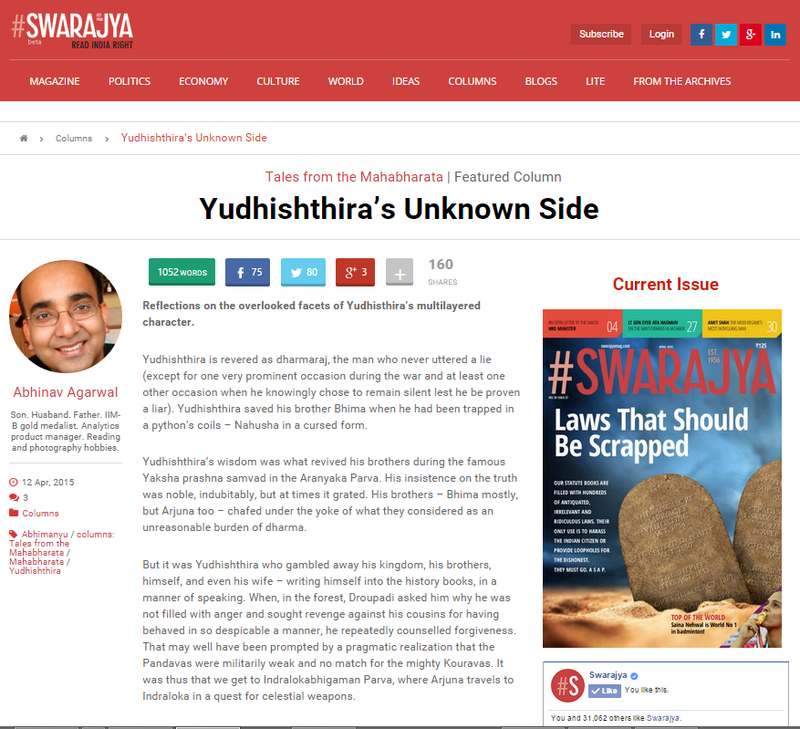 My piece appeared in Swarajya on 12th April, 2015. Yudhishthira is revered as dharma-raj, the man who never uttered a lie (except for one very prominent occasion during the War and at least one other occasion when he knowingly chose to remain silent lest he be proven a liar). Yudhishthira saved his brother Bhima when he had been trapped in a python's coils - Nahusha in a cursed form. Yudhishthira's wisdom was what revived his brothers during the famous Yaksha prashna samvad in the Aranyaka Parva. His insistence on the truth was noble, indubitably, but at times it grated. His brothers - Bhima mostly, but Arjuna also - chafed under the yoke of what they saw an unreasonable burden of dharma. It was Yudhishthira who gambled away his kingdom, his brothers, himself, and even his wife - writing himself into the history books, in a manner of speaking. When, in the forest, Droupadi asked him why he was not filled with anger and sought revenge against his cousins for having behaved in so despicable a manner, he repeatedly counselled forgiveness. That may well have been prompted by a pragmatic realization that the Pandavas were militarily weak and no match for the mighty Kouravas. It was thus that we get to Indralokabhigaman Parva where Arjuna travels to Indraloka in a quest for celestial weapons. But Duryodhana's unyielding intransigence was to give way to an almost plaintive plea for mercy when Yuddhishthira and the Pandavas found him out hiding in a lake. This is what the Kourava had to say - "I will clad myself in deerskin and leave for the forest. ... I have no desire for the kingdom," [9.30, Vol VII] Stunned? I certainly was. Yudhishthira had made this a fight to the death. No quarters were to be given. A facet of Yudhishthira that's often overlooked. What do you make of it? Note: I have used Dr Bibek Debroy’s Mahabharata, Volumes 6 and 7, an unabridged English language translation of the Critical Edition of the Mahabharata, published by Penguin India in 2012 and 2013, respectively, as my reference.